NorthStar introduces a groundbreaking remote management solution, named NorthStar ACE (Advanced Connected Energy), that will change the way energy storage is managed. About 15-20 million batteries are purchased each year for telecom site backup power. More than 50 percent of these are replaced prematurely due to insufficient control throughout the product life cycle. Batteries are not properly managed and maintained in warehouses, installations are incorrectly performed and in operation the batteries are exposed to suboptimal power system settings, elevated temperatures and theft, resulting in shortened battery life. With NorthStar ACE, this is about to change. NorthStar ACE is a fully integrated solution combining Bluetooth communication with an IoT concept. Using NorthStar ACE (Advanced Connected Energy) the user can retrieve real time and historical performance data wirelessly, both locally through a smartphone app and remotely through a cloud service. NorthStar ACE will improve your efficiency at every stage of the process: from warehousing, through installation and operation, to battery replacement. NorthStar ACE Central provides 24/7 monitoring of the global battery population. The system delivers predictive reports for service life and replacement planning, as well as alarms in case of malfunctions. Right from the beginning, NorthStar batteries are tagged with key data on our production line. Upon arrival at the warehouse, NorthStar ACE automatically connects to Central through the NorthStar ACETM Gateway. 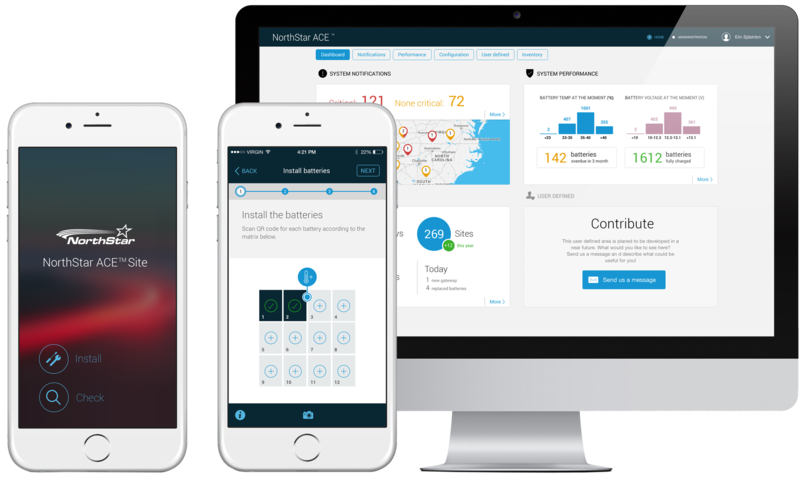 The Site app will then guide the technician through a complete installation and create an installation report automatically. The power system parameters will be automatically set when the battery is installed.